I learned to sail shortly after moving to Seattle. The Center for Wooden Boats at south Lake Union offered an excellent program that helped me feel confident operating 18 foot sailboats under sail. 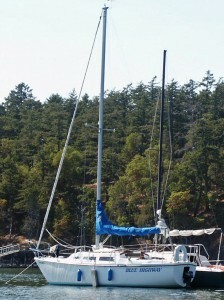 About a year after completing the course and after much looking, I purchased an old but well cared-for Catalina 27. I sailed the boat on Seattle’s lakes and in Puget Sound and even spent a week cruising around the San Juan Islands. A year and a half later, when the mounting requirements of routine maintenance could no longer be put off, I sold the boat. As far as I could tell there was nothing terribly wrong with it. But there were a lot of small issues and my ignorance combined with the boat’s inherent design flaws conspired to make each task seem both murky and monumental. Never own a boat that does not merit the emotional and financial investment required to maintain it. My Catlina was a fine boat for recreational, inland sailing. But it was mass-produced and the design favored inexpensive construction and lower quality components; future maintainability was not an obvious design value. When the diminutive widget on the port side doo-dad broke, there was no way to repair or replace it. The entire doo-dad system had to be removed and replaced, which turned out to be an appallingly complex, unintuitive and costly affair. It was far more sensible to learn to ignore the broken widget and live without it. The precedent did not bode well for the long term condition and value of the boat. By contrast, a well-built boat is designed from the start so that it can be reasonably maintained, repaired, and upgraded over many years. This type of boat is built of better quality components and capable of withstanding rough conditions and crossing oceans. When a widget breaks, a replacement part can be obtained and fitted to the doo-dad, which can be disassembled and re-assembled. Such a boat encourages good maintenance habits and repays its owner with predictable performance. Having found such a well-built boat, one that is well equipped and a good value, the next episode in my personal boating story is about to begin. Although functional and sound, the boat is far from being in tip top condition (there’s no accounting for individual owners and a boat’s own story). Unlike the Catalina, I am as excited at the prospect of working on this boat as I am sailing it. If all goes well with the survey, there will be much more to say about it in the weeks to come.